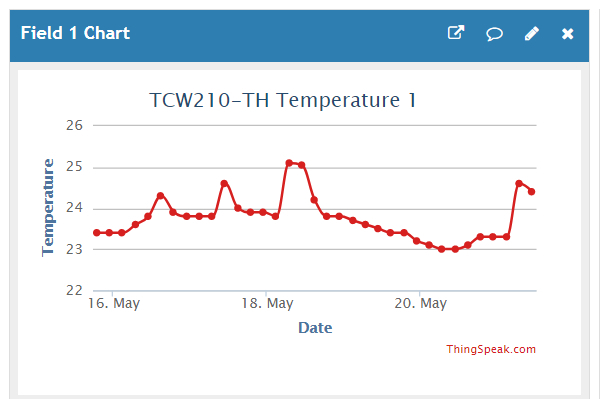 TCW210-TH is a device that registers and stores information for up to 8 sensors (temperature and temperature-humidity). This information is stored in a flash memory and can be visualized in graphics in the web interface. 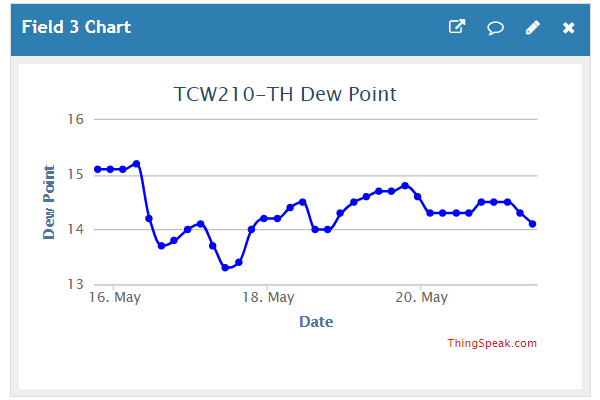 One of the many services implemented in TCW210-TH allows the user to send sensor information to the already well-developed IoT platform ThingSpeak that allows collecting information in private channels, sharing that information in public channels, analyzing and visualizing the information, as well as other functions. 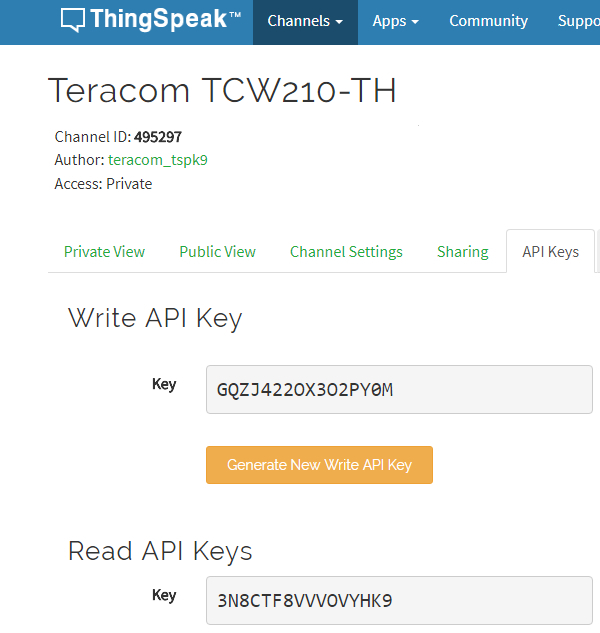 The present article shows the steps that are needed to be done to allow the connection between TCW210-TH and ThingSpeak servers. 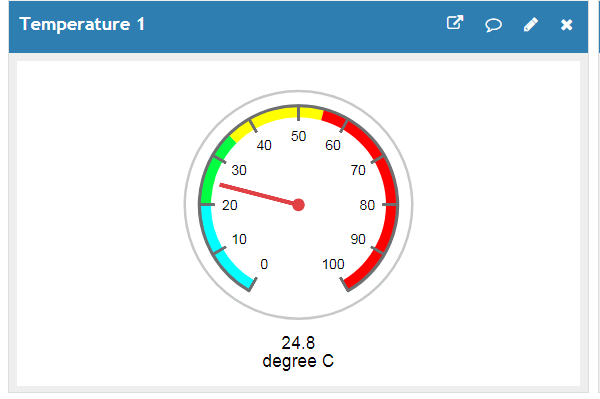 In order to have access to the functions of the ThingSpeak platform the user needs to create an account in Mathworks, that will be later linked to ThingSpeak. After being created the account needs to be confirmed using a link sent to the email of the user. Once confirmed, the account is active and linked to the ThingSpeak platform. ThingSpeak is based on information channels. At their creation, they receive a unique identification number and API keys that the user can check after the channel is being created. 3.1. From the web interface of the user account, the menu Channels > My channels is selected. Here the user can also see already existing channels. 3.2. The New Channel option is selected. The minimal information required for the channel to be created consists of a channel name and the name of the fields that are going to be used. 3.4. After the channel is saved, it is visible in the Channels > My Channels menu. 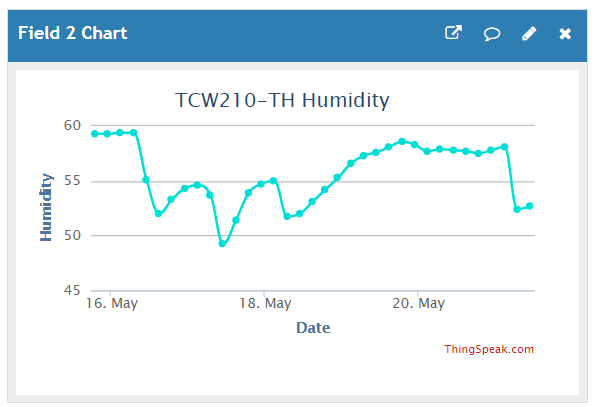 The following configuration steps are executed in the web interface of TCW210-TH to allow the sensor information to be sent to the channel that was created in ThingSpeak. 4.1. From the menu, the option Services is selected. 4.2. From the submenu, the option Cloud is selected. 4.4. The following changes are made in the Channels 1 field of the webpage. For the purposes of this article, a channel was created using the steps showed in point 3. Тhe configuration steps shown in point 4 were executed in the web interface of TCW210-TH. 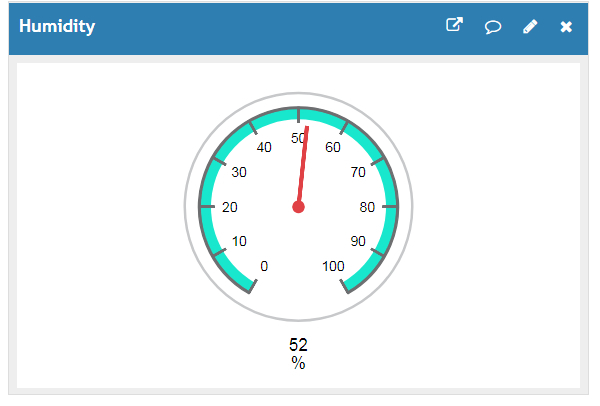 The sensor information is presented in graphics and the current value of the sensor is shown in a gauge. 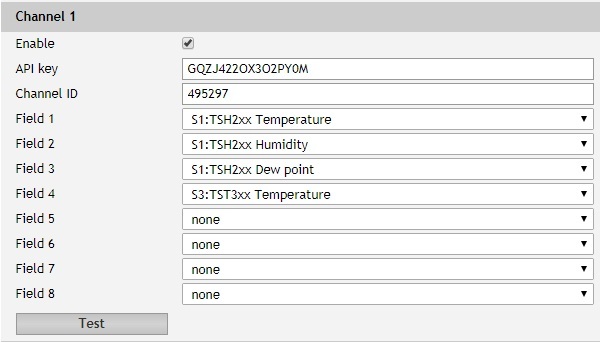 The information (Identification numbers, API keys, and field values) used in this sample configuration and shown in the images refers only to this configuration. 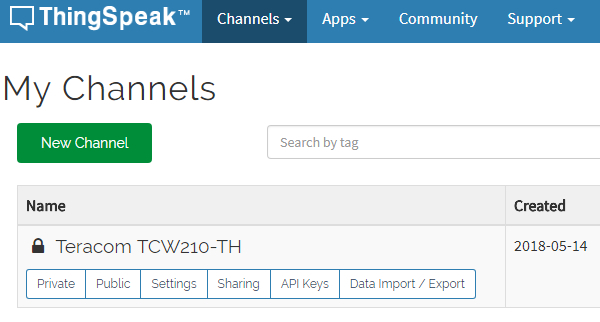 When configuring, the user should use information that is uniquely referring to his channel in ThingSpeak. 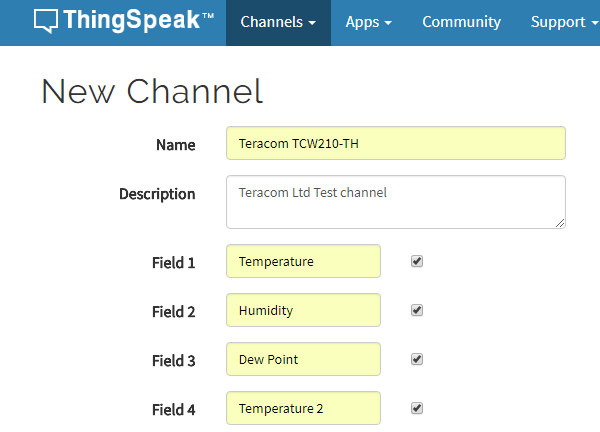 To add a new channel to the TCW210-TH configuration, the channel needs to be first created in the web interface of ThingSpeak. 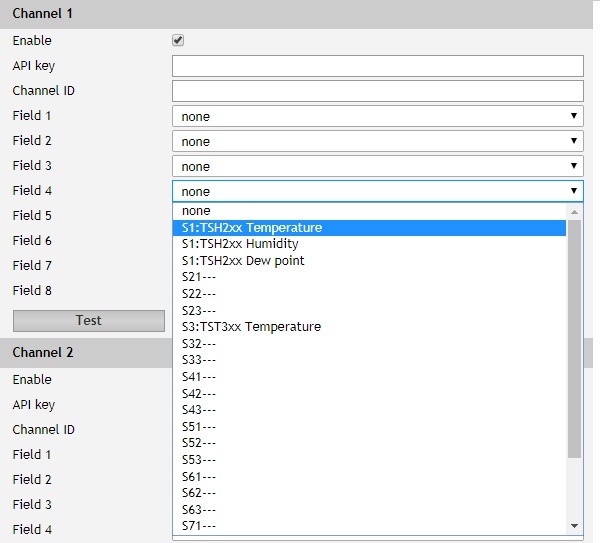 Using the channel information (identification number and Write API key) the user can then use the steps shown in point 4.4 to configure a new channel. TCW210-TH allows 4 channels with up to 8 fields (sensor values) to operate simultaneously.